A new video appears to present the frightening moment the Nigerian army assaulted the home of Biafra separatist leader, Nnamdi Kanu in Umuahia in Abia state. The video captures the sounds and early bits of destruction that took place on September 14th as soldiers involved in "Operation Python Dance" unleashed deadly force on the compound. 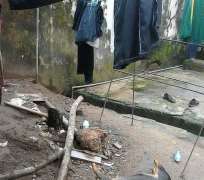 What appears to be pools of blood are seen in the compound, possibly from injured occupants whose bodies had been dragged into the house as the assault continued. A young lady is seen among other members scampering around the house while the shots rein on the building. "I am live," the recorder says as he runs around the house. According to members of the now proscribed secessionist group, 28 people were killed in the attack including several family members of Nnamdi Kanu who has since been declared missing along with his parents. Some of the dead bodies were said to have been found in nearby bushes as the injured fled and died of their wounds. The assault on the compound was so deadly, even the family dog, "Jack" was not spared. There has not yet been a statement from any survivor of the assault including the person who took the latest shocking video. It is believed that everyone in and around the home was either killed or abducted by the military. The military has however not released any official statement after the attack on the number of casualties and whether any of the friends and family members were abducted. Other videos and images after the assault, showed a bullet riddled home with total damage and destruction both outside and inside. Nnamdi Kanu's room among other chambers was totally ravaged and bullet riddled in the aftermath images. The Abia state police department indicated after the attack that it was unaware of the exact details and proceeding of the deadly military action as several lawyers and rights organisations have decried the military deployment as unconstitutional. An attorney, Chuks Nwachukwu on Channels TV called the announced "show of force" as an act of terror by the government according to Nigeria's anti-terrorism bill which prohibits the use of force by any actor to terrorize the citizenry. The assault on the home of Nnamdi Kanu is reminiscent of the December 2015 military action in Zaria during which in addition to 4 other sites, the home of Islamic movement leader Shaikh Zakzaky was raided and his three sons and sister were killed along with dozens of minority Muslims gathered at the house. In that event, Zakzkay and his wife were shot several times but survived, which led to continuos protests and condemnation locally and internationally, with loud demands for their release. The courts additionally ordered the release and compensation of the victims, an order the Buhari government flouted with the chairman of the Presidential Committee on Corruption, Itse Sagay joining in publicly rebuking the the Buhari-led administration. Whether the army decided to prevent a repeat of the Zakzaky situation by either killing and making away with the bodies of Nnamdi Kanu and his parents, or abducting them silently, is impossible to confirm. However such a scenario is plausible considering the refusal of the army under command of General Tukur Buratai to admit to the Zaria massacre and secret mass burial of hundreds of Shia minority Muslims even after the Kaduna government made a late confession to the crime. The military till date insists that only 6 citizens were killed in that attack, thus promoting public distrust and poor credibility levels. It is over two weeks after the assault on Kanu's residence. While the Nigerian army has denied having Nnamdi Kanu in its possession, it has not yet released word on the number and identities of those killed and whether Nnamdi Kanu's parents were killed or abducted. The happenings in Nigeria under democratically elected dictator Muhammadu Buhari are beyond troubling.